» Any change at Bowers Rock? Any change at Bowers Rock? Wondering if anything had changed in the last year, on Sunday I took the bike down Bryant Way to the entrance of Bowers Rock State Park. And the answer is no, nothing has been done to make public access to the place any easier than it’s ever been. The state of Oregon acquired several hundred acres on the Willamette River west of Albany in the 1970s with plans for an access road, parking lots, walking trails and other attractions. 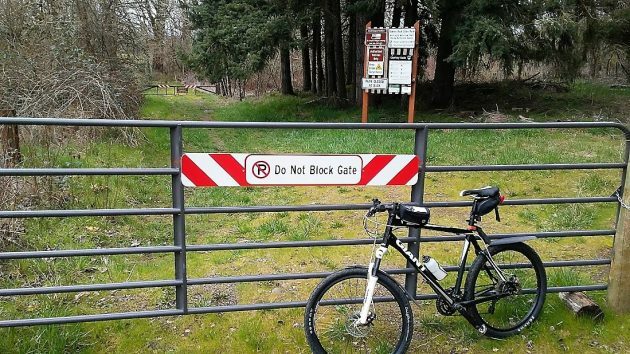 The state parks department then abandoned those plans, but it maintains a gate and an access point to the undeveloped 568 acres at the west end of Bryant Way, a gravel road. There is no place to park, though, and signs warn against it. So now and then, people have been parking on the shoulders at the corner of Bryant Way and Bryant Drive for the quarter-mile hike to the gate. Getting there on a bike is faster. Property owners have posted the road to keep the public out, but the state has an easement guaranteeing access. 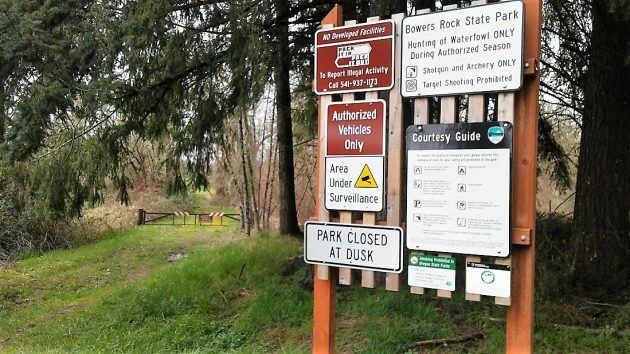 In recent years officials of Linn County have inquired with State Parks about the county taking over management of Bowers Rock with the goal of providing better access. But nothing has come of this. When I checked last fall, no progress had been made, and I haven’t heard of any since. A priority Bowers Rock clearly is not. There is one thing that has changed at the entrance. The state sign board has acquired a new message since I was there last May. “Area Under Surveillance,” it says. I looked around but didn’t see any cameras. Putting one in wouldn’t be a bad idea, though, especially if neighbors are concerned about troublemakers in that out-of-the way spot. That warning about camera surveillance wasn’t there when visited the park last May. Thanks, again, for all your reporting that we otherwise wouldn’t know about. This poor orphan was on the list. No surprise that #1 is Silver Falls.